A group known as the Canal Village Development Corporation (CVDC) has expressed its interest in purchasing, from the city of Sault Ste. Marie, the land west of Station Mall and east of Mill Square to build a multi-use development. City council will be asked Monday to direct city staff to enter into negotiations with the Canal Village Development Corporation. CVDC principals Shaun Rothberg, Paola Rovazzi, Henry Cole and architect Franco Pastore will be in attendance at Monday's council meeting. The Canal Village Development Project would form part of a current large-scale strategy to redevelop a much larger area known as the Canal Zone, which includes Mill Square and the Gore Street corridor. The Canal Village Development Project would include wellness facilities with involvement from the Sault YMCA, an indoor turf facility for soccer and other activities, a park, trails, bike paths, a retail and restaurant component and a residential component with condominiums and apartments. A report to council from the CVDC states that a feasibility study must be done, but that the city must first commit to the group's acquisition of the property. The feasibility report will involve discussions with partners interested in being part of the development, market research to look into additional possible components for the development area, meetings with the city to examine infrastructure needs, and looking into funding opportunities for the project. The Community Geomatics Centre (CGC), in a letter to Mayor Christian Provenzano and city councillors, supports the recreational aspect of the proposed development, particularly for the benefit of children who live in the downtown core. The letter states a CGC study shows the health and well-being of 47 percent of senior kindergarten children in the area is at risk due to the lack of parks and recreation facilities in the downtown area. Amit Sofer, president of TVM Sault Inc., the group which purchased the old Sault Area Hospital site and is currently transforming it into Riverwalk Condominiums, has also expressed his written support for the project, stating it would be an ideal westerly complement to TVM's easterly downtown condominium development. Kim Caruso, chief executive officer of the Sault Ste. Marie YMCA, has also provided her written support for the proposed development to council, stating the YMCA is pleased to be part of the development discussion. Caruso states the development would bring much-needed recreational facilities to an area of town and a segment of the community's population that needs them. 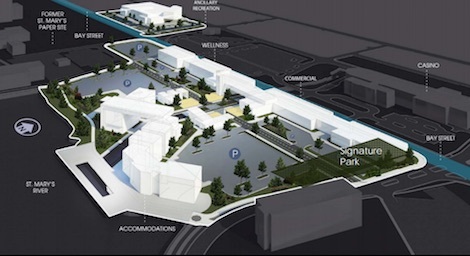 An artistic rendering of the proposed Canal Village Development Project, provided by the Canal Village Development Corporation, is shown above.